Multifactor authentication (MFA) is a critical security requirement for every organization, regardless of size and industry. But not every MFA solution is created equal. Your investment in MFA should be well-thought-out. Not only does your chosen MFA solution need to meet the requirements you have today, but it needs to enable and secure the future growth and evolution of your business. This evaluation guide will help you understand the key factors you need to consider when investing in MFA. Your MFA choice determines how well you can protect access to all your internal resources, as well as your ability to provide frictionless experiences for your internal employees and external customers. Your MFA choice also impacts your ability to grow your business and take advantage of emerging technologies and future innovations. 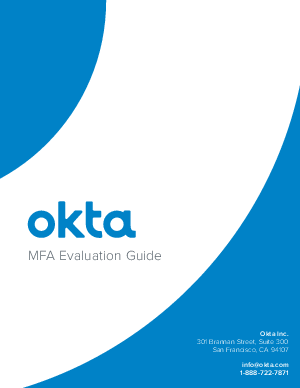 As part of Okta’s identity-led security framework, Okta Adaptive MFA delivers on the key considerations that need to be part of your search for a solution that meets all your MFA requirements today and in the future. Okta Adaptive MFA enables you to address the different levels of security and identity assurance of all your different user types, including your internal workforce, partners, contractors, and customers. Its wide range of authentication factors give you the flexibility you need to deliver secure and frictionless user experiences, while keeping your costs low. The extensible nature of Okta Adaptive MFA and its more than 5,500 out-of-the-box integrations make it easy to implement MFA across all aspects of your environment, including your on-premises systems and applications, third-party hosted platforms, cloud services, mobile apps, and more. The Single Sign-on, Lifecycle Management, Universal Directory, and API Access Management services in Okta’s Identity Cloud allow you to turn on additional identity management capabilities with ease whenever needed. With Okta Adaptive MFA’s modern, next-generation MFA capabilities, such as Adaptive MFA, responsible password-less authentication, authentication intelligence with Threat Insight, and IDP discovery/routing, you can future-proof your ability to meet the MFA requirements your organization and users demand today and will need tomorrow.